"Looking North, across Federal Street and Congress Street, from Exchang"
Looking North, across Federal Street and Congress Street, from Exchange Street. Looking north, across Federal Street and Congress Street, from U.S. Custom House (Exchange Street and Middle Street). "Looking North, across Federal Street and Congress Street, from Exchange Street." (1866). The Great Fire : 1866 - Stereoscopic views. 10. 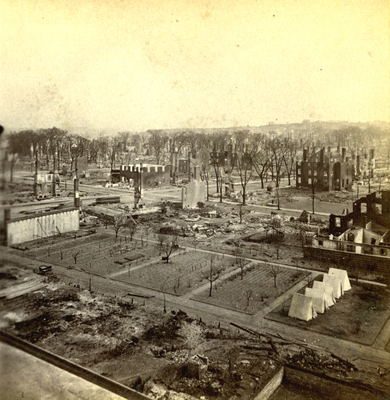 Portland, Me., Great Fire, Portland, Me., 1866, Federal Street, Congress Street.